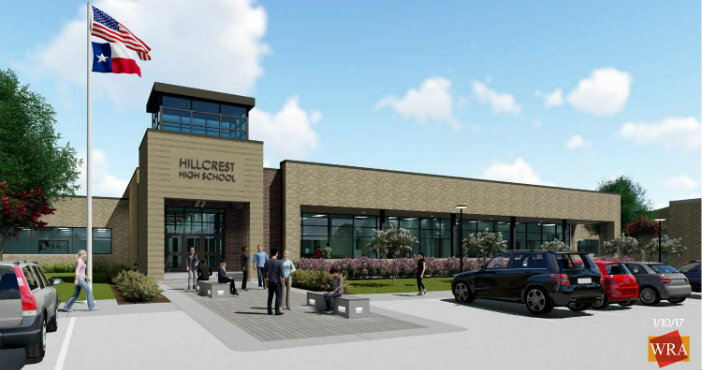 Hillcrest High School junior Jose Diaz is excited about the $21 million facelift his school is receiving under the district’s 2015 Bond Program. Diaz, who has attended Hillcrest since freshman year, says it’s a good thing for the school even as he concedes his class will be all but out the door by the completion of the work in December 2018. “We’ll be the last class to witness the old campus, but we’ll be proud alumni when we come back from college to visit,” said Diaz, who was the sole student in attendance at the Jan. 10 community meeting held to discuss the improvements. Architects and project managers presented a detailed plan for the construction upgrades due to begin as early as May 2017 with the demolition of outdated structures on the campus. The project includes a new public entrance to the school, new administration offices, a two-story classroom addition with spaces for students to gather, collaborate and study, upgrades to fine arts spaces, and a 1,000-seat gymnasium with locker rooms and a tornado shelter. The total package of improvements will expand the campus from the current 144,000 square feet to 202,000. Like Diaz, the school’s PTSA, site-based decision making committee and nearby residents had generally positive reactions to the walk through of improvements. Questions focused on student safety measures during construction, disruption and relocation of classes, and the impact of traffic on surrounding residents. Diaz said the improvements will be worth the sacrifice. He has two cousins just beginning high school at Hillcrest and other family members looking to attend in the future.